wheremmsgather: Sketch Challenges and New Rubbah....oh! and Happy Anniversary! Sketch Challenges and New Rubbah....oh! and Happy Anniversary! I couldn't wait to use my new Delightful Decorations stamps and punch. I seem to have a thing for punches, especially really cool ones that punch the stamped image for you. This card is also for the sketch challenge on StampTV. 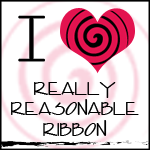 A pretty clean and simple card using Ridinghood Red cardstock, dp, and striped ribbon. 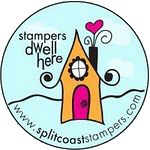 I made this card for the sketch challenge on Splitcoaststampers (SCS) yesterday and never got a chance to put it up on my blog. It's also for the Mothermark Miss You teapot challenge hosted by MariLynn on SCS. 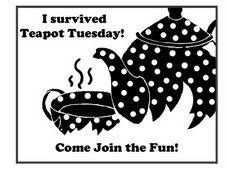 Cindy is taking a couple weeks off, so MariLynn thought it'd be fun to still have a teapot challenge. Here's the inspiration teapot. Go to post #273 and click on MariLynn's link if you'd like to play along. I'm a day late and a dollar short getting mine done and missed most of the party gals. Today is my wedding anniversary. Hubby and I are going out to a fancy schmancy restaurant out of town for dinnah to celebrate. Now, if I can just quit eating my m&ms.....I need to save my appetite for the real food! Happy Anniversary! Enjoy your dinner and day! Pretty cards, I like the new ornament. oh char! these are gorgeous! i love the dark chocolate m&m's and so does granddaughter! MMMMMMMM yummy! Beautiful cards - Charlene!!! Awesomne layouts on both!!! 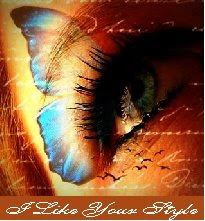 You did a wonderful job on the SC too!!! Beautiful cards, Charlene! At stamp club, our demo has been using that punch for aspen leaves by cutting the very top off and drawing in leaf veins...and making Fall cards with it. Didn't know if you'd heard that use for the punch! Spectacular creations! 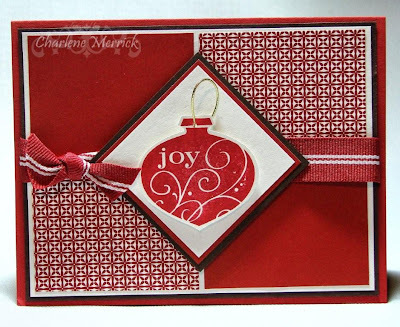 I love the clean, crisp look of your Christmas card and the wonderful rich, warm texture your added to your Fall card. Charlene, I am starting to get worried about Cindy! 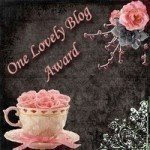 She hasn't blogged in ages. Hope everything is okay...please let me know. Both cards are super duper AWESOME, Charlene...I love all the red on the Christmas card and the little fall trees are just gorgeous!!! I hope you had a wonderful anniversary....fancy schmancy is a good thing!!!!! Two beautiful cards, Charlene. 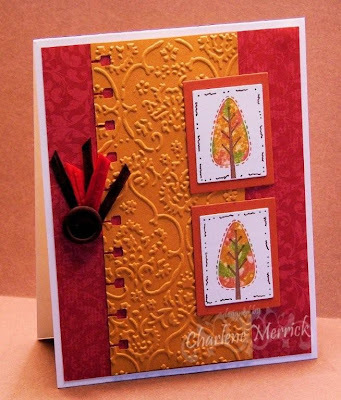 Love the rich texture and colors on the autumn card. And the ornament card is so bright and wonderful. Congrats on your wedding anniversary! Beautiful cards Charlene! Love the leaves especially!